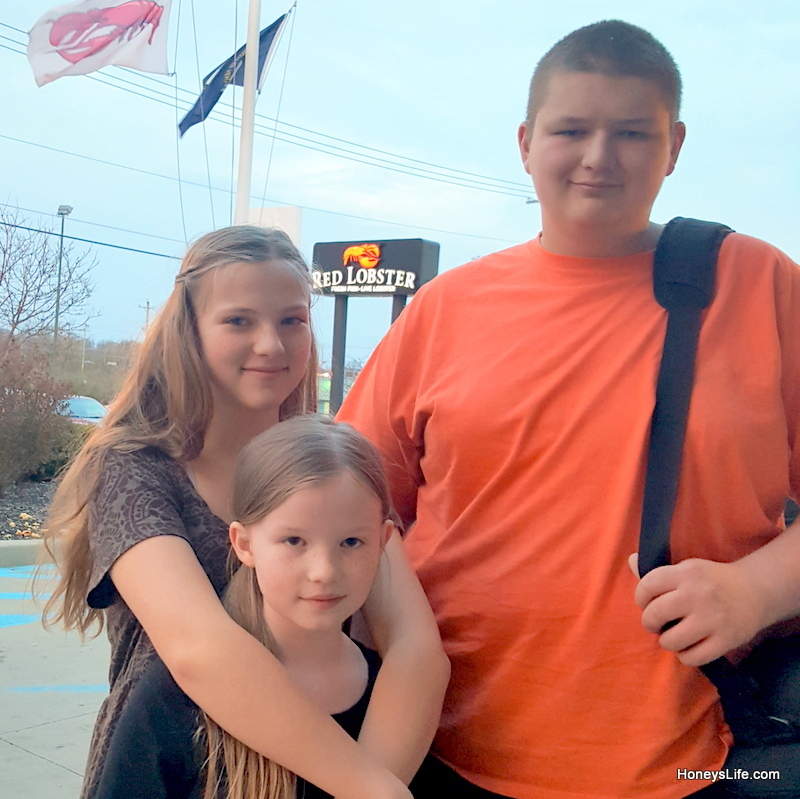 Red Lobster has been a way for our family to celebrate special events like date nights and birthdays in our family. Since we’re landlocked homesteaders, Red Lobster is where we go to celebrate our special events. We don’t get to enjoy it often enough. Ben, my husband, and the kids love seafood but I’ve always felt lobster was something special and needs to have a lobster worthy reason to eat it. Ben always said it was because I watched too many movies from the ’90s. Celebrating Tyler’s birthday is the first time we’ve been back since Ben passed away. 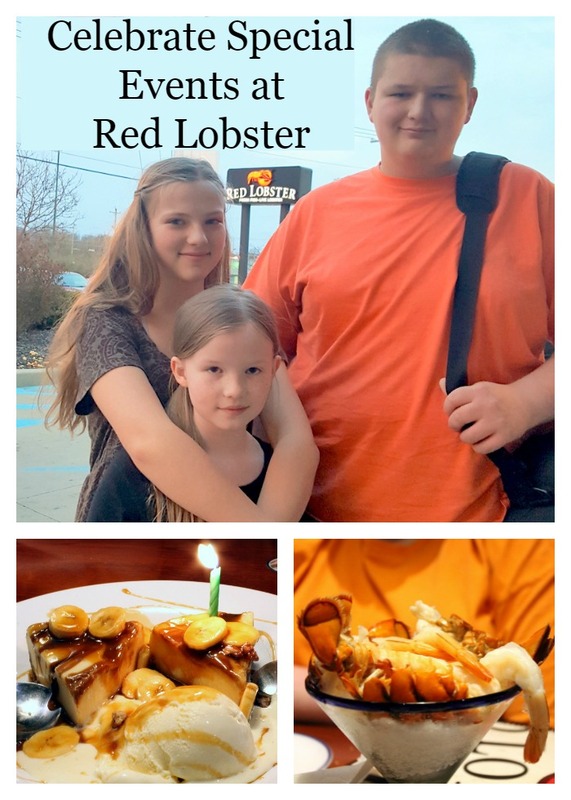 On our way back home I looked up the nearest Red Lobster seafood restaurant location and stopped in Florence, KY. Tyler was going to have the Red Lobster Lobsterfest for his 18th birthday like Ben, his daddy, had promised him. It wasn’t too hard to find somewhere and off we went for a great birthday celebration which started out a bit sad since Ben wasn’t there to celebrate with us. And, just like a date…just because someone else pays doesn’t mean anything is due them which means all opinions are 100% my own. Ben was our seafood expert and since I had never had lobster before I ended up Facebooking live seeking help. We had no clue how to eat it. I never once thought of asking Brice, our waiter, how to eat lobster. It would have saved embarrassment then again all y’all know we’re not fancy folks so I went live. The kids were laughing like loons without sense and ended up playing with the shell. 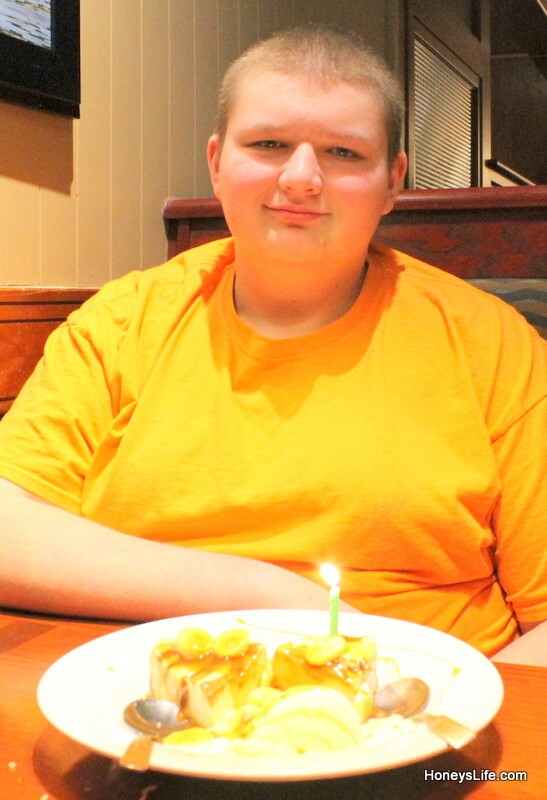 It was actually the most fun we’ve ever had at a Red Lobster and considering how hard the past few months have been since Ben passed away I think it was a pretty good thing. We first shared an appetizer of Chilled Lobster & Shrimp Cocktail (featuring lobster and shrimp that are poached in-house and served over a bed of shaved ice). We also ordered Ben’s favorite, calamari, to enjoy as well. 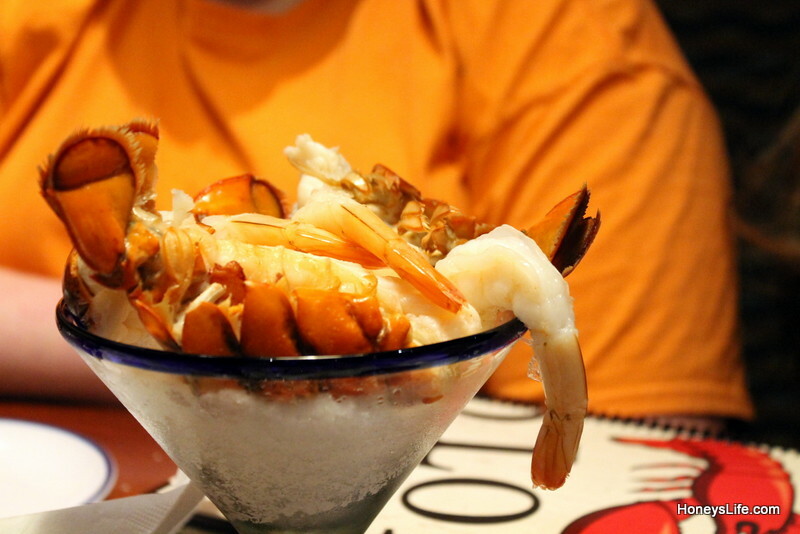 Red Lobster’s signature cocktail sauce that you dip your shrimp into; oh…yeah…that stuff is GOOD! The kids were not a fan of the cold yummies but I loved the shrimp and lobster cold! Being biscuit hounds they also enjoyed the biscuits. Tyler had the Lobster Lover’s Dream (featuring a succulent roasted rock lobster tail and sweet split Maine lobster tail) and Rhea ate Lobsterfest Surf & Turf (a flavorful combination of lobster, steak and shrimp). Being gluten free I enjoyed a steak and so did Sunshine. Every single one of us took home a box because it’s a LOT of food placed on those plates. We are used to going for lunch at Red Lobster and were pleasantly surprised by the portion sizes. Bub is 6’3″ wears a size 15/16 shoe and he was full. We were all stuffed. I wanted to make going to Red Lobster part of the surprise for Tyler and I didn’t bring a birthday cake with me. So, when I was looking up a location I noticed they had NEW! Bananas Foster Cheesecake, (featuring two slices of caramel cheesecake topped with warm, freshly sliced bananas, caramel and spiced rum and served with vanilla ice cream and candied pecans)**. Hello birthday cake! So, I stopped and picked up a birthday candle and lighter after calling and confirming the Florence location was ok with lighting a candle. The person on the phone was like ‘Yeah! Of COURSE!’ Ya gotta love friendly service. 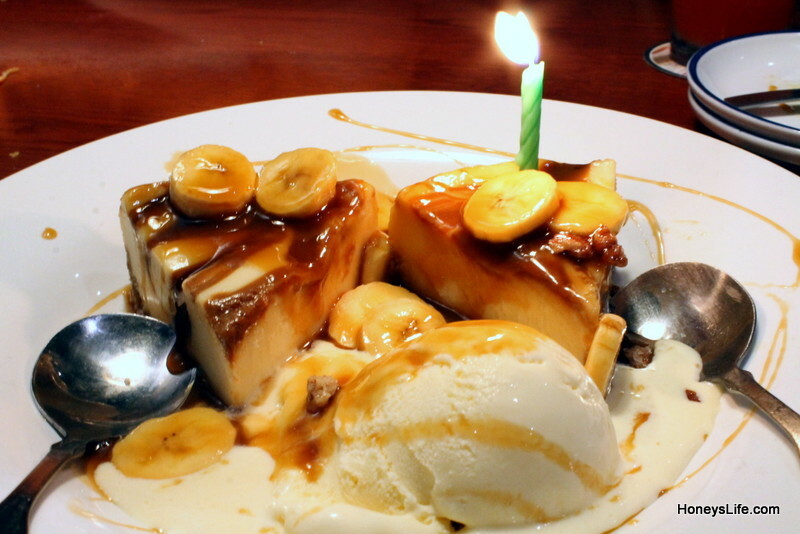 Brice, our waiter, asked us if there was anything else we’d like I said 2 Bananas Foster Cheesecake please and voila! Four yummy pieces of cheesecake appeared. Followed by the girls and I softly singing, “Happy Birthday” to Ben and my beautiful first born baby. Everyone enjoyed this dessert which made for a nice ending to this special birthday meal. **Being gluten intolerant I can’t eat the crust of the Bananas Foster Cheesecake but I did eat the cheese part and didn’t have a reaction. So, I’d check on that because och is it YUM! Lobsterfest details: The collective Coastal glass comes free (while supplies last) with the purchase of one of the featured Lobsterfest cocktails. “Lobsterworthy” describes a moment or an occasion that you consider so special that you have to go celebrate with a delicious lobster. What special event is coming up that’s #lobsterworthy in your life? Wow all that food looks so fantastic! I’m really going to go into Red Lobster soon. It’s not some where that I ever go but man those pictures look so good I’m definitely puting it on my next date night! What a great celebration! 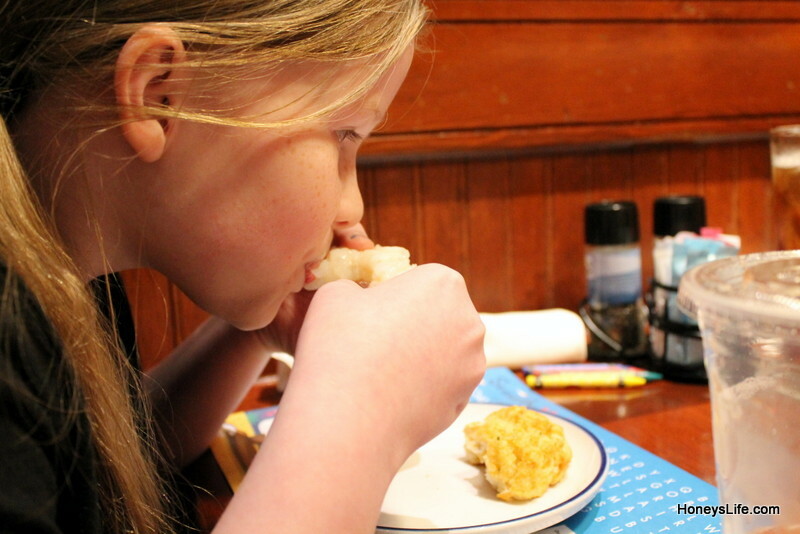 We love Red Lobster for our family’s special moments, too. Happy Birthday to your son! Thanks Carissa! I’ll pass the happy bday wishes along! It was a great celebration too! Happy Happy Birthday Tyler! I would love that cheesecake for my birthday cake too any day. Red Lobster is a fun place to celebrate any special occasion. So happy y’all had a great time. Thanks Nicky! We had a great time! 🙂 I passed the happy bday’s onto Tyler too. Oh man! Now my mouth is watering for lobster:-) I can almost smell the buttery sauce ! And now I’m craving one of their biscuits! ? Okay, I’m really gonna need to make a date for Red Lobster ? Not only is the food great, but Red Lobster is also a great place to work. I worked there all during college and had a great time. I’m so glad you were able to make Ben’s birthday promise to Tyler come true. Lovely post, Honey. 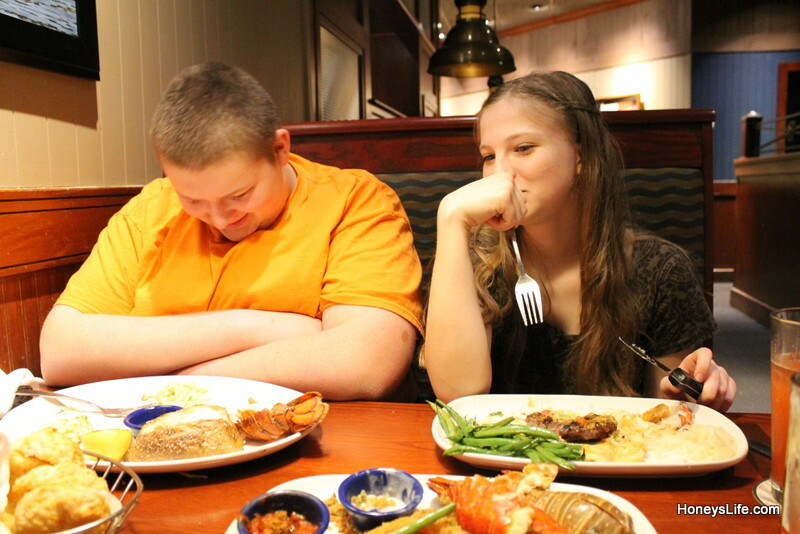 Your children look they really enjoyed dining at Red Lobster. Those plates look huge and that dessert looks amazing. Thanks for sharing how you celebrated your son’s 18th birthday. Glad to read how you are continuing the family tradition! I had no idea LobsterFest was back and I live less than a mile from Red Lobster! You’re welcome! I couldn’t believe how much food was there! My poor little Sunshine ate half her Bananas Foster Cheesecake and slumped in the corner and goes, “I can’t…it’s so good but I really just don’t have room!” Even Tyler! Totally full! You’ll have to go because there are more dishes this year. I think they said they added 5 new ones. And, the chilled shrimp & lobster is REALLY good! Love that cocktail sauce. We do this to! For land locked folk we love sea food ! Red Lobster is our favorite place to celebrate big events. Birthdays .anniversary s. , promotion, feel free to go and enjoy!